This reviewer has something to confess: he’s not a huge fan of Amy Winehouse. Her highly-publicised lifestyle aside, her music never seemed to do anything for him nor did it seem especially inspiring or, to be brutally honest, even that original to begin with. Though he has no argument against the fact that her tragic death in 2011 was indeed a tragedy, the work of Amy Winehouse left absolutely no impact on him whatsoever. But after watching Amy, the biographical documentary from Senna director Asif Kapadia, he can honestly say that he has a touch more respect for her than before. Of course, that’s exactly what happened to her and as the movie charts her climb to the top, culminating in her Grammy win for Record of the Year with her single “Rehab” – a moment that lovingly captures her genuine shock as she wins – you see the weight of fame starting to pull her down internally. Endless harassment by the flashing lights of the paparazzi – when the opening disclaimer makes a warning to anyone with epilepsy, they’re not kidding around – as well as tabloid exposure and eventually her much-publicised drug abuse seem to mould her into the kind of laughing stock we used to associate her with, and the way that Kapadia treats this as some kind of harmful drug in its own right is extremely hard to watch. Worse, however, is the influence of selected figures around her, in particular ex-husband Blake Fielder-Civil who the film implies to be some kind of free-loader taking advantage of her fame and fortune while also damaging his body alongside her with their shared drug intake. It’s also clear to see why father Mitch Winehouse has publically distanced himself from the film, even threatening to sue the filmmakers for a less than flattering portrayal of him being some kind of fame-hogging stage parent, even having a camera crew follow him and his family for a TV special during a quiet family holiday. We’ll never know the truth behind all of this, and whether Blake and Mitch were indeed as the film depicts them is anyone’s guess, but it does suggest that Amy’s downward spiral partially stems from her troubled connections with these two people and that, more than anything, can be more lethal than any narcotic she could have taken. The film, however, doesn’t focus entirely on the negative – it also celebrates her musical accomplishments, and as her songs play on the soundtrack their lyrics light up the screen which gives the audience a chance to appreciate her writing abilities as well as her own unique vocal stylings. One particularly haunting moment, worked wonderfully through King’s editing, is of Amy recording “Back to Black” in a sound booth, and as the complete song nears its climax it suddenly cuts back to her singing the last few lyrics with the backing track all but muted. There, in that moment, we hear the raw voice of Amy Winehouse crawling out for the first time. If that moment doesn’t send shivers up and down your spine, then frankly nothing will. 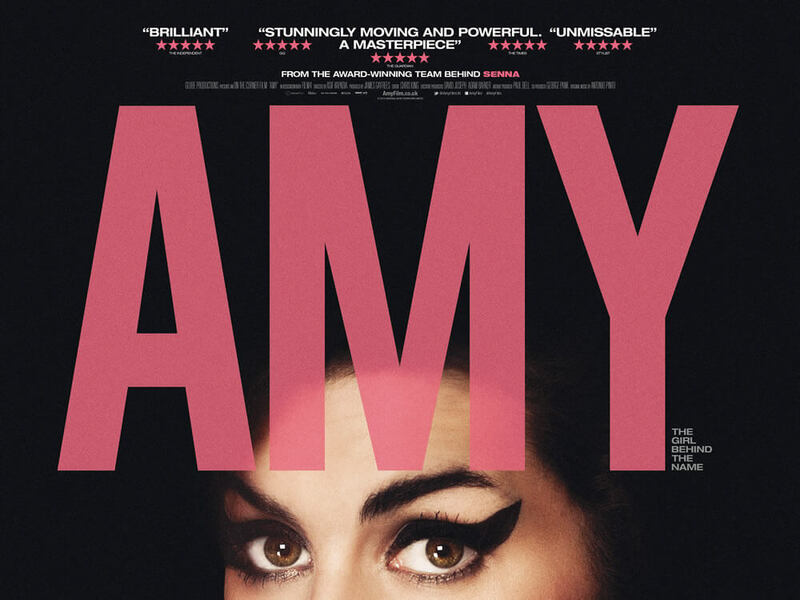 As not much of a fan of Amy Winehouse, this reviewer can at the very least appreciate the hard work that has gone into Amy to show a completely different side to her which inspires a whole new form of respect for a lost talent. 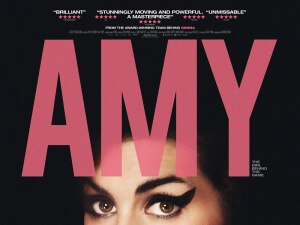 Amy is a powerfully-made documentary that highlights both the ups and downs of Amy Winehouse’s troubled career, and portrays both to a very moving and insightful degree that inspires a new sense of respect for the late singer’s dedication and undeniable talent.